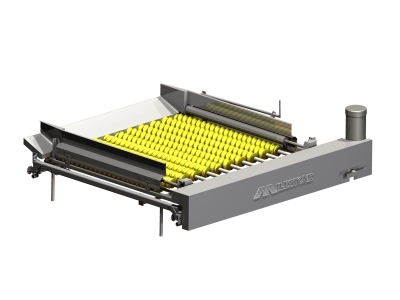 Available in numeours pitches and lengths the unique design of the Accusizer screw is ideal for almost any operation. The screw is designed to provide years of worry free operation. Heavy duty shaft reduces unwanted flex for improved accuracy. The spacing between rollers can be easily adjusted by a conveniently located adjustment handle. Once the accusizer has been adjusted locking handle ensures that the desired position does not change. Safety is a top priority at Milestone. As such all moving parts and potential hazard points are thoroughly guarded so your most valuable resource is protected, your employees! Washdown and Stainless options are available depending on your requirements. High grade motors and gearboxes are used to help reduce downtime. Gearboxes come standard with food grade oil. Avaialble S.S. construction if your application requires. Safe and reliable performance! Milestone designs and manufactures a diverse line of sizing, cutting, debris elimination and conveying equipment for processing applications. 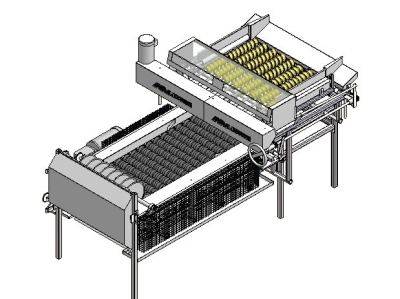 Each piece of processing equipment built by Milestone is designed to be maintenance friendly and deliver safe, effective and continuous operation. Available in both stainless steel and carbon steel Milestone is committed to providing a quality machine that will increase your operations efficiency.